World Wide Technology (WWT), a technology solutions provider with locations around the world, has installed Leyard and Planar LED and LCD displays throughout its new 208,000-square-foot global headquarters in St. Louis, Mo. 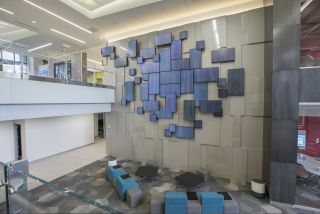 The installation, completed by Coltrane Systems, includes a Planar MosaicArchitectural Video Wall composed of 50 LCD tiles in the building’s new atrium area. It also includes an impressive 55-feet-long by 13-feet-high Leyard TWA Series 1.8 millimeter pixel pitch LED video wall at the front of the company’s 300-seat auditorium. Six Planar UltraResSeries 4K LCD displays are built into the walls of the auditorium, with several more installed in the executive boardroom, the employees’ network café area and the building’s new corporate lobby. WWT chose Planar Mosaic because of the endless possibilities it provides for creative expression and the delivery of art and information. Planar Mosaic features three different sizes of LCD video wall tiles that can be mounted in any position and angle relative to each other. In addition to the stunning video walls in its atrium and auditorium, WWT has installed Planar UltraRes Series 4K LCD displays throughout many areas of its new headquarters. Several 98-inch Planar UltraRes Series displays have been placed in the executive boardroom to support high-level presentations and enhance video conferencing through a vivid and immersive experience. Two Planar UltraRes Series displays are installed in the employee network café area and a Planar UltraRes Touch display has been incorporated into the building’s new corporate lobby to welcome visitors and provide engagement through customer testimonial videos. The Planar UltraRes Series was selected for its superior performance and exceptional 4K clarity. The Planar UltraRes Series features Ultra HD resolution (3840 x 2160), offering a best-in-class solution for boardrooms, collaborative meeting spaces and high-impact digital signage applications. Planar UltraRes Touch adds interactivity to the experience by combining stunning 4K image clarity with 32 points of multi-touch. Planar UltraRes Touch displays feature Planar ERO (Extended Ruggedness and Optics) technology, a bonded glass surface that adds durability and protection while minimizing the effects of glare.